I have been thinking about this website for some time and tentatively put it ‘out there’ yesterday by posting a link on the Lapidus and International Academy for Poetry Therapy Facebook pages. I have been heartened by the warm response and also stimulated by some of the questions. In 1925, Robert Haven Schauffler wrote: ‘any poem that has genuine healing in its wings usually commences its medical career the moment it is conceived by promptly curing its creator.’ Does a Poetry Therapist climb a rickety ladder and reach a plateau of well being? I am not asking about status, and I am sure each individual will take a different path, but I wonder whether overcoming health issues can earn one a greater sense of resilience. Robert Haven Schauffler was probably overstating the case when he says ‘any poem’ but I offer these reflections by poets quoted in Writing Routes. 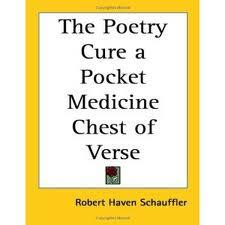 Robert Haven Schauffler uses the word ‘promptly’ – Rose Flint, also in Writing Routes, describes writing a healing poem, but her journey from conception to cure was not made quickly: ‘The first part of the poem remained virtually unedited. It took about nine months to write the second half, with dozens of drafts. It was hard, like sculpting granite … the vision, the meditation and then the work were all necessary processes that I needed to go through to shift the depression’. Katrina’s second question has also set me thinking, about ladders and plateaus and the metaphors we use for our sense of health and self, but it’s time for breakfast and then a dog walk in the breaking dawn. First, I want to thank you for launching ‘Poetry Therapy News’ and making it so accessible. Next, I would like to spend longer seeking to understand how ill health influences the output of a writer. This is against a backdrop of an urge to launch into an argument, justifying why I am always provocative. I hope I am not abrading the intangible support of the beautiful poetry you bring to your work. The debate is etymological, involving tense and tension. Somehow, to me, the nature of art therapy is that it does not prescribe a cure but creates an environment in which care and curiosity can combine to discover new insights into inalienable truths, both supple and grounded.. It is wonderful to be reminded of the breadth of experience in ‘Writing Routes’.